37% of Republicans believe Barack Obama was not born in the United States. 30% of Republicans believe Barack Obama is a Muslim [not that there’s anything wrong with that — thanks to Jerry Seinfeld]. It is difficult to imagine a presidential election cycle with more of a circus atmosphere than 2016’s. At the time of this writing, Donald J. Trump has clinched the GOP nomination by racistly and sexistly (Yeah, I made up two new words) maligning almost every demographic group known to political pollsters. The Republican Party has long since abandoned its “Never Trump” stance, which most GOP luminaries had adopted early in the primary, before his repugnant freight train of a campaign vanquished all possible respectable contenders. Republican leaders have violated their own personal and political principles; they now support the most vile, egomaniacal confidence artist ever to befoul a television screen. Baby boomer kids were taught to fear nuclear annihilation while in grade school. Now we have to fear it again, because imagine this: Donald Trump could be president. So how did this happen? We can start with the shocking 2008 election of the first African-American U.S. president. Republicans and KKK members didn’t know what hit them. But once it sank in, they were going to ensure, over the next four years, there would be no repeat. Every dog-whistled trick in the book was pulled out and new ones were invented. 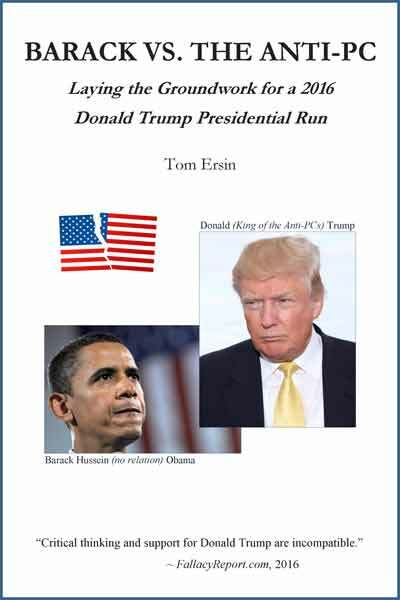 Trump, though he teased but declined to run in 2012, launched his war on PC (political correctness) and championed the racist “birther” conspiracy, that Barack Obama was not born in America. Actual candidates, such as Newt Gingrich (notwithstanding his simultaneous book tour), Michele Bachmann, et al., chimed in with their supporting birther innuendos and more. And if they couldn’t prove the president was not a citizen, they could insinuate and even declare, in speech after newspaper headline after talk show appearance after speech, that he thought like an un-American and he wasn’t one of us. Did I also mention that Obama is black? (not that there’s anything wrong with that). From 2008 through 2012, the Republican Party made it clear that it was now acceptable to be boorish, racist, and xenophobic, i.e., anti-PC. At every instance of overt or covert bigotry aimed at the president from within its own ranks, the GOP and its leadership’s response was — crickets. By ignoring it, by looking the other way (because let’s face it: the racist xenophobia was helpful to their vote count), they told their people anything goes. Donald Trump heard that anti-PC message loud and clear. Several days after Mitt Romney made his limp-fish concession speech, Trump trademarked the phrase “Make America Great Again,” the rallying cry and slogan for his 2016 campaign. GOP movers and shakers — who couldn’t stomach Trump until they had to swallow hard after he won the nomination — floated several reasons for The Donald’s narcissistic rise. Most ridiculous among them was that President Obama had laid the foundation for Trump. Other than his blackness, Obama had nothing to do with this despicable phenomenon. Republicans, you did this all on your own. Barack vs. the Anti-PC lays out the real foundation for Donald J. Trump’s political rise: the 2012 presidential election cycle. 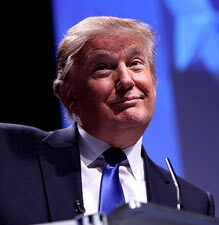 The GOP set a record for outlandish, misinformational campaigns in 2012. Then they smashed their own record in 2016. The rest is histrionics. After the 2008 presidential election, the losing team was in shock. Soon, shock turned to anger. On inauguration night, about 15 of the top Republicans in Congress gathered at the Caucus Room, a high-end D.C. establishment, not to lick their wounds but to ensure the failure of Barack Obama’s first term and 2012 re-election campaign. They would block everything the president tried to do, no matter how much Republican support a policy or piece of legislation had garnered in the past — and no matter what the cost to the American people. To buttress this effort, the tea party was hatched in early 2009 with heavy stealth support from superrich GOP backers. Ostensibly an organic grass-roots movement, in reality it was an anti-Obama propaganda arm of the Republican Party spewing racial undertones and overtones and accusations of “otherness.” The GOP indulged its embarrassing, bigoted tea party cousin (with whom it secretly agreed — or, at least, didn’t publicly disagree) to keep him in the fold. Are all or most Republicans and their supporters racist? No. But when even the respectable ones fail to repudiate the vocal minority, their failure amounts to tacit approval of that racism. America’s election of her first non-Caucasian president produced a political reality show not seen before, including a colorful cast of cartoon characters. Former House Speaker Newt Gingrich — famously referred to as a stupid person’s version of a smart person — honed his dog-whistled racial stereotypes about the president. Attention-starved billionaire Donald Trump appointed himself cheerleading team captain for the birthers, who disguised their racism behind the red herring belief that Obama was a Muslim born in Kenya and therefore not eligible to be president. And who can forget Rush Limbaugh (“Take that bone out of your nose and call me back”), Sarah Palin (Obama’s “shuck and jive shtick must end”), Michele Bachmann (Obama is running a “gangsta government”), and of course, Mitt Romney (“No one has ever asked to see my birth certificate. They know [where I was] born and raised.”). Together they coddled tea party rumormongers perpetuating outlandish myths about the president, attempting to convey that he was not one of us. But it was never because of his ethnicity (wink). 22% of Republicans believe Barack Obama wants the terrorists to win. 24% of Republicans believe Barack Obama may be the Antichrist. 51% of Republicans believe Barack Obama wants to turn over the sovereignty of the United States to a one-world government. President Obama was called a socialist and a fascist — by the same people. He was called an atheist and a Muslim, again, by the same bipedal primates. These were oxymorons committed by morons. And I had to speak out. Barack vs. the Anti-PC is a humorously serious, mostly chronological commentary of articles and essays interspersed with classic quotations, related headlines, and short news source excerpts. It’s a rebuttal of the critics, a portrait of the anti-Obama circus. It documents the Republican establishment’s look-the-other-way tacit approval of rampant bigotry and xenophobia within its own party. Most of these pieces were originally published in my online magazine (don’t call it a blog), FallacyReport.com, from the 2008 presidential election through Mitt Romney’s clinching of the Republican nomination in May 2012. Barack vs. the Anti-PC flows, in roughly chronological order, through a series of this author’s articles and essays. I have punctuated these with a series of gray boxes featuring my own headlines, with occasional supporting content from other authors/reporters. Their content is always carefully attributed to them and their publication through detailed citations. Through this amalgamation of articles, essays, headlines, quotations, and a little external content from other writers, readers will be able to assimilate the flow of important political and related social events, along with this author’s wry editorial opinions.